On Thursday, the Independent Investigations Office (IIO) issued a media statement saying the Acting Chief Civilian Director has made a report to Crown Counsel in relation to an incident involving the Vancouver Police. Essentially they are saying one or more of the officers involved in a shooting on June 10, 2014 “may” have committed a criminal offence. Yet again, we see the IIO overreach is what should be a cut and dried case. Let’s look at just how cut and dried. At approximately 11:10 in the morning Gerald Mark Battersby, 61, pumped multiple shots with a .357 revolver into 52 yr. old Paul Dragan outside the Starbucks at Davie and Marinaside Cres. As it happened, a couple of VPD officers were just pulling up in front of Starbucks, drew their weapons and challenged Battersby who replied by shooting at the police then fleeing on a bike onto the Sea Wall towards Science Centre. Police gave chase and called for cover units to try and block Battersby from the other side. During the chase more shots were fired. Once at Science World, Battersby was engaged by members of VPD. More shots were exchanged. A female VPD member was trapped in her police car as Battersby shot into it, wounding her with flying glass. Another officer using the police car for cover got caught as Battersby chased him around the car firing as the officer tried to desperately find cover. Battersby was armed with a six shot .357 revolver. He’d already re-loaded at least once, perhaps more. As he had the male officer within a couple of feet and down he was shot by at least one of the covering officers and by the wounded female officer in the car. Security video seized by the VPD in their investigation was shared with the IIO. The video clearly shows the exchange of gunfire, the pursuit of the male VPD member and Battersby being shot and going down. How, in the name of all things holy, could anyone think this was anything but a justified use of force by the VPD? It’s stunning really. Here’s a couple of screen grabs from the security video. It shows Battersby pointing the .357, the barrel is protruding from a wrapping. 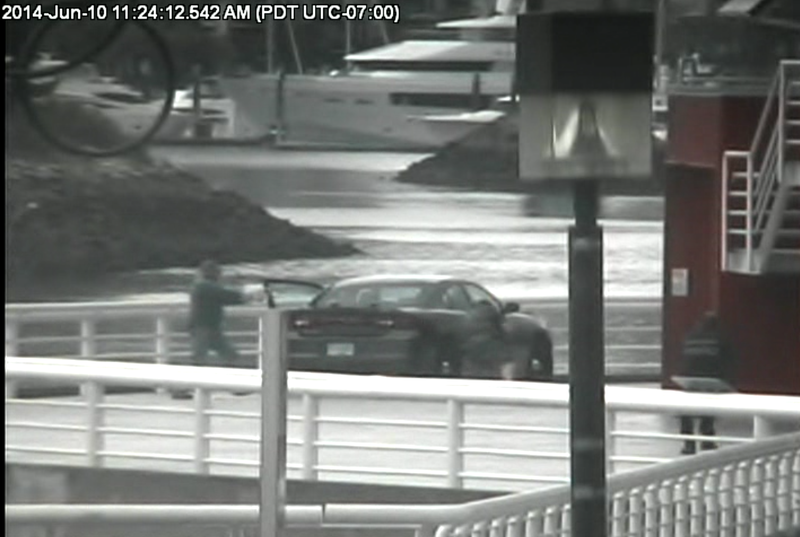 You can see the male VPD member ducking down on the passenger side of the vehicle trying to avoid the shooter. One of the VPD members who shot Battersby can be seen in the lower right. As we saw in the case of Delta PD Cst. Jordan MacWilliams, the IIO leap to conclusions they shouldn’t because they simply do not understand policing or the use of force parameters. They get a whopping 10 weeks training at the JIBC, but zero ‘use of force’ training, the very thing they are supposed to investigate. Another part of the problem is the wording in the Police Act which essentially says if the CCD of the IIO believes an offence “may” have been committed he shall send a Report to Crown Counsel (RTCC). This is far lower than the standard the police must meet before they can submit an RTCC in a criminal case and far lower than the standard which Crown applies to approve a criminal charge. At the very least, that needs to change. The police are not the enemy here. They protect us from the likes of Battersby. And, as demonstrated on that day in June last year, they do it with courage and professionalism. Which is much more than I can say about the IIO. But as with everything else when we look at these cases, there’s more. During his interview with the IIO, the “Affected Person,” Battersby told investigators that his plan was to shoot Dragan, one more person and then shoot at police to get them to kill him. He intended to do everything he could to force the police to shoot him. So, despite all of this and dozens of witnesses who corroborate the actions of the VPD, the IIO evidently still thinks at least one of the VPD officers did something criminal in this incident? A day after the inexplicable release by the IIO, which now casts a shadow over heroic police officers, Deputy Chief Doug Lepard, as Acting Chief in the absence of Chief Adam Palmer, sent an email to all VPD officers. What is clear in the email is that this was an unexpected surprise from the IIO. But also that those officers have the complete support of the Chief Constable and his senior management team. These are not the words of someone who thinks any VPD member did anything wrong that day. Quite the contrary in fact. That no one died that day is about the only good thing. To put a cloud over the actions of the courageous VPD officers involved is shameful. Two of the four RCMP officers involved in the incident at YVR that resulted in the tragic death of Polish traveller Robert Dziekanski were found guilty of perjury in bizarre decisions and given custody sentences. I don’t believe either will serve any time at all. And the reality is that none of the four needed to be put through the hell that they have these last seven years. Both Cpl. Monty Robinson and Cst. Kwesi Millington have filed appeals of their convictions and given the other two Mounties involved were acquitted at bar and the Crown appealed one and was soundly defeated in the Court of Appeal, it seems likely the appeals will be successful. At least I hope that will be the case. I have stated this before and will say so again; not one of those four officers did anything wrong. They responded according to their training and the RCMP policy such as it was at the time. For them to be in criminal proceedings at all is a travesty. Let alone for the trumped-up charges of perjury. Throughout, the media narrative has been relentless all based on misconceptions that could have easily been cleared up had only the RCMP as an entity, done a better job of communicating with the public instead of hunkering down in the bunker, so to speak, and hoping things would blow over. The fall-out of those bad communications decisions resulted in the convictions against two of those members for perjury, mind you, nothing to do with the events at YVR. Which in itself, is ludicrous. In the Millington case as an example, Mr. Justice Ehrcke decided that a perjury was committed because he “inferred” they must have colluded. The alternative is that he could have “inferred” they were telling the truth, which they were. What Ehrcke ignored, conveniently, was it was physically impossible for the four members to have colluded at the Sub-Detachment following the event simply because Robinson as the supervisor on the scene remained at YVR awaiting the IHIT investigators while the other three went to the Sub-Detachment to make their notes and await Robinson and the IHIT investigators. In the interim, Sgt. Mike Ingles, their Staff Relations Representative, arrived at the sub-detachment and sat with the members. Yet somehow Erchke arrived at the decision he did and in my opinion will be overturned on appeal. But more telling to me is the phone call made by S/Sgt. Ken Ackles, who was oncoming watch commander in Richmond a few hours after the event. He called Robinson’s cell and asked what had happened. Robinson said, ironically, “Don’t worry Staff, we’ve got a video that shows the whole thing. There’s no problem.” He was, of course, referring to the so-called Pritchard video. Now, I ask you, if Robinson believed for a minute there was anything wrong with the handling of the event or indeed, that they had some need to collude, to get their story straight, why would he say that to Ackles? Why would all four give statements to investigators voluntarily without benefit of counsel as they were advised by Sgt. Mike Ingles? The answer of course is simple. They believed they had handled everything appropriately and had done nothing wrong. After all, as Robinson said, they had the video which backed them up. Little did he know what effect that video would have once the uninformed media got hold of it. Had the RCMP done that, the story would have died a death within the news cycle. But they didn’t. The Inspector in charge of IHIT at the time, Wayne Rideout, who is now part of the senior management team for the RCMP in BC, made the decision not to correct the record. Lemaitre was removed because essentially the media labelled him a liar and he had lost whatever credibility he had earned over the years. Everything resulted from that one, stupid decision by Rideout. The Braidwood Inquiry and it’s wrong-headed conclusions, the subsequent Kennedy report, the Special Prosecutor and the resulting criminal charges against the four officers, everything, resulted from that one ill-advised decision. The other thing that has not occurred is that the RCMP has never once said publicly that their members reacted according to their training and within policy as it existed at the time. They’ve said it privately behind the scenes when the senior management declined to order a Code of Conduct investigation against the YVR four. No one in senior management offered a word in disagreement. And, that includes current Commissioner Bob Paulson. But they, as the senior management team, stood mute in public as the Force in general and the YVR four in particular, were being pilloried in the media. Had they not done so, I believe they would have avoided the ensuing public relations debacle and the resulting damage done to the reputation of the iconic national police force. Well, I asked, why not say that publicly at the time? He responded, reasonably I suppose, that while in the position as Commanding Officer of E Division it wouldn’t have been appropriate with all that was going on, with what he called a media “feeding frenzy.” But that now, as a retired civilian, he is free to speak. Fair enough. I then asked about the decision not to correct the Lemaitre statement that led to all the troubles that resulted. He said he was not aware of the decision at the time, but that he felt as the CO he had to trust the decisions made by his unit commanders. Also fair enough. But, I can’t help but think that had he engaged in that conversation with the officer in charge of IHIT and reviewed that foolish decision, a lot of grief might have been avoided. Not to mention the north of $50 million the incident has cost the taxpayers so far. But then, hindsight is 20/20.